I have great memories of Nickerson Farms. A free box of candy was given with a gas fill-up of 10 gallons or more!! (gas was 39 cents per gallon in 1967) The gift shop was filled with jams and jellies, fresh honey, country cured bacon and ham from Alewells meats. Cashiers offering free samples of candy (snow coated pretzels, honey brittle, cashew brittle). Nickerson’s had its own line of delicious candy displayed on the inner wall of the gift shop. Unique gifts including Imperial pottery, Smith Glass, Ozark Walnut bowls, Daken plush toys, and of course the swirling “crazy ducks” in a glass pie dish of water located at the end of the cashier’s counter. How can you forget the overstocked tables and shelves of souvenirs? In it’s heyday arguably the best restaurant chain on the interstates. Home of the never empty individual pot of coffee (15 cents), Individual fresh baked loaves of bread served with fresh honey butter. Country breakfasts, fresh cooked deep fried chicken, charbroiled steaks, hot roast beef sandwiches served open face!! Anyone remember the Rail Splitter?? I can almost taste it right now!!!! I first worked at the Joplin store while attending college. Worked into management having the opportunity to work at many of the locations around the country and ended up working at the home office in Omaha until 1980. Would not trade the experience for anything!! Met and worked with many, many wonderful people. I worked 22 years for Nickersons & also worked out of the Omaha Office as District Supervisor over Michigan, Ohio, Ind., Ky., & helped open units all over the country in Minnesota, Iowa, Mo., Ok., Texas, Ark., my name is Mike Godfredson, I live in Michigan now. In 1984 I took the Nickerson Farm Rest. in Fowlerville, Mi. and turned it into Fowlerville Farms Restaurant from 1984 to 2001. Are you Marti Tignor? Thanks for the memories. How about the sesame sticks, the bird which "drank" the water, or the do nothing machines. We had all you can eat fried chicken or fish on Sunday. I washed dishes for a while and the smell of fresh bread and honey butter made my day, thanks to Grace Clements for that memory. Can you tell me any more about the start or end to the company? I would love to have more history. I started my work life at Nickerson Farms in Menefee, AR off interstate 40. I started as a dish washer then moved up the latter to cook. One Saturday a big ole bus pulled in and this tall guy wearing a long black leather coat strolled in with a party of 8. That man was Johnny Cash. I got to cook for him. He ordered fish and chips. Talked with everyone there that day. Anyway, thats my one of many fond memories of Nickerson Farms Restaurant. I remember working there initially at the Emma, MO store (I-70) as a night cleaner when I got out of the Coast Guard in 1980. I got locked in the store and had to clean the whole place up all night long, it was also to double as night security. Vacuuming, cleaning the bathrooms, mopping the kitchen and walk-in's. I did that for about a year and applied for management training and went through it there, closing the store, I then transferred to Pocahontas, IL (I-70) as Assistant manager and worked there from 1981 til early 1983 when they terminated me due to budget cut backs. I was offered a position at Rensselaer, IN but turned it down as I got work with another restaurant chain. I remember fondly all the quaint stuff in the gift shop, the food in the restaurant, and all the interesting people that used to come in daily. My father was a Nickerson Farms manager at the Phillipsburg, Missouri, New Braunfels, Texas, Oklahoma City, Joplin, Missouri, Annawan, Illinois (Called Farmer's Table), and Weimar, Texas stores. My brother and I have many happy memories of all of the fantastic people who worked at these stores. Would love to hear of their memories! I also Managed New Braunfels & many other Locations across the country!! I am getting more comments all the time, please keep checking back. I worked at Phillipsburg from through high school, left in 1975. If your dad was there in this time I bet I know who you are. There is a Nickersons Farm on US-23 near Ottawa Lake, MI just north of the Ohio-Michigan border. The buidling is still there with a for sale sign. Years ago it changed names to 23 Fuel Stop. It still has the tudor outside and high roof. Ate many meals with my grandparents there. I managed Ottawa Lake from 1971 to 1973, then managed Fowlerville, Mi., then in `1974i opened Nickersons Tin Lizzie Dinnerhouse w/ liquor, then I was a district manger for 5 states, in 1980 Nickersons bought the franchise for Godfathers Pizza for the NW. Ohio area & Hawaii, I opened 23 Godfather Pizza Restaurants, in 1984 Nickersons went out of business. Great Company, I was there 22 years! Spent 7+ years in Nickerson Farms (the TAE Corp. part) store management in Illinois (Farmers Table was the company's brand there), Missouri and Colorado. Helped open a few, and closed one (in the mid-80's when TAE Corp. was on its last legs). Met Mr. Nickerson a couple of times during his road travels - quite a character. Fancied himself another Col. Sanders, and played the part well. Lots of memories of hard work, solid (and a few not-so-solid!) employees, unexpected tour buses, loose bees, endless gift shop inventories, and, of course, the motoring public. I spent 22 years w/ Nickersons, opened 75% of all restaurants!! I loved this place, fabulous food, great gift shop items, cute and fun stuff on the tables for the kids, and the beehives! I can still smell the fresh bread and honey butter! They used real food, and really cooked it there! Not like todays restaurants. I didn't even realize, at the time, that it was a chain. We stopped at the one in Harrisonville MO, quite often, with my late Grandparents. What a wonderful memory! I'm assuming they're are no more open, is that the case? I would be willing to travel, if there were another, and if it were the authentic Nickerson Farms! There really should be more places like that! There's an old Nickersons still standing in Cameron, MO only now being used to sell fireworks. My Mother,and Aunt both worked there for several years in the 70's and I worked there in 79 and 80. My Mother was a Back-up Cook and her sister/my Aunt was Fry Cook and and Assistant Mgr at a KS location for a short time and I worked in the Gift Shop. It was certainly a happy family back then. A great Crew and Managers to work with. I remember the Bee hive well and all the great regular customers. The sad day it closed. Don Dungy one of the Best Manager ever. I worked at Nickerson in the late 70's in Cameron, MO in the Gift Shop. My Mom and Aunt worked as cooks there too. I remember the wonderful people I worked with. Loved the fresh baked bread and honey butter and the crowds on Sundays standing in the parking lot waiting to get the fried chicken, yummmmm I can still taste it all. I loved working there! The beehive was of course the main attraction alng with the candy sampling and the great selection of unique gifts there. Had some great regular customers as well as all those just passing thru. I knew what they would say when they came to pay...........the best fried chicken and fresh bread they'd ever eaten. Ah those eyes of wonder at the beehive the children really were fascinated along with the adults. Ummm the cashew brittle, country cured bacon, wooden ozark bowls, pottery. It was sold to TAE Corp and then utlimately closed, a sad day. It is still standing in Cameron, Mo and operating as a fireworks store. Hello former Nickerson Farm employees! My experience with Nickerson farms started when I was 16 years old. The power had been off and there was no water. I started my short career by washing dishes by hand overnight and running them through clorox water to sterilize them. I worked as a dishwasher and bus boy eventually moving up to working the buffet line on Sundays. Yes, I was the one wearing the funny hat and cutting the roast beef. Some time later, I worked as a backup cook and some on the fryline. We had the world's fair in Knoxville in 1982 and I worked many hours breading and dropping chicken for the constant arrival of tour buses off of Interstate 40. I oftern reminisce of those days, young, ignorant, but full of life and dreams. The restaurant is gone now of course and the only thing that remains of that 16 year old kid is a few dreams. If you worked at the Nickerson Farms restaurant in Sevier county Tennessee say Hi! My first taste of seseme sticks was at the Joplin location. They had the best bread and honey! And they treated my infant son so well!!! 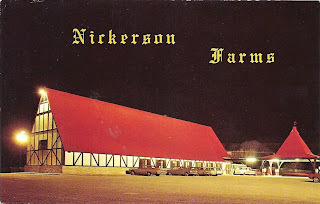 My husband has fond memories of Nickerson Farm Restaurants as well. His parents and he traveled and always looked for them. His Father said you should look for places where semi drivers and cops went to. That's where good food and good service would be found. They were never disappointed. I worked in the Nickerson Farms in Colby, Ks in the mid seventies and it was one of the most fun jobs I have had in my life. I remember working with Phyllis who worked there as a waitress, she bought herself a brand new car on her sixteenth birthday with the money she earned there. The whole group was phenomenal and I moved away in 1977 but still miss them. I would love to get in contact with any of them to this day. I worked at the Nickerson Farms in Colby, Kansas with a fantastic group of people. It is still one of the favorite jobs that I have ever had and this is because of the people that I worked with. we could have a full house and still have fun. I would love to see or hear from some of the people that I worked with. My email is bevmatt2002@yahoo.com. Someone else may remember, my sister would probably know, but I think the gravy came from a mix with some sausage mixed in. I really never worked breakfast so I don't know for sure, I bet someone else out there does. Hi friends I was manager of a Nickerson Farms from 1980 to 1983. I was in Blackwell Ok then went to Hinton OK on I-40. At that time we worked six days a week and approximately 60 to 70 hours a week. I could see the writing on the wall in eighty three. In three months the whole chain closed. Bad corporate management was their downfall. I had over four thousand dollars in bonuses coming and I received four hundred. I met Mr.Nickerson once as I was cleaning the bathroom and he said you must be the manager I said I was and he introduced himself to me. What a honor. He told me I had the cleanest one of all the Nickerson Farms. The TAE Corporation bout just a few after he sold them. I always believed that they had Mafia ties out of Chicago lots of strange money transferring go on. We was a great experience for me and many happy times. Sometimes I wish I was back there again. I worked for IJ Nickerson, IJ sold the Nickerson Farms company to Mr. Lee Schaefer around 1971. Lee then sold all the Nickerson west of Mississippi River to T.A.E., ie Farmers Table. TAE is who cheated you on Bonus! I worked for Lee as District Supervisor & Dir. of Operations until 1984. I worked for NF when I was 13, as bus girl and dishwasher in Bennett Colo. This was my first official job. I rode my bike a mile out of town to I-70. I have great memories and still remember the recipe to the honey butter,still make it yet today for my family. Wish I could still get some of their Cashew Crunch candy. It was wonderful!!!!! We lived in Detroit and moved north west and stopped at Nickerson Farms a couple times a month. Loved the bread and bakery foods, honey butter. Loved watching the bees making honey from the glass window inside the restaurant. I still stop at Fowlerville Farms, but it just isn't the same. Miss the store and all the shelves with almost anything you can image on them. My name is Ross DeRosa. My Father was Anthony Salvatore DeRosa. One of my most cherished pictures on my wall, is my Fathers "Chef Of The Year" award. It was presented to him by "The Managers of Nickerson Farm Stores" on November the 4th, 1976. I was not even 7 years old. It's signed by H.B Hart Jr. President, and...Luther Henson? Although, it's hard to read, because its someones signature. H.B. I remember well, spent many days at his house when i was a child, his wife's name was Loretta I do believe. H.B. was VERY tall, and was a WW2 Veteran. Having the distinction of being "battlefield promoted" from a Sergeant, to a Colonel! My Father was with Henry's Drive Inns, for many years, until the company broke up in 1975 or so. He started out as a cook, then manager, then district manager, and kept working his way up until he was President and CEO. Try doing that TODAY without a college education! I am astounded that people are still talking and typing about these places that have been gone for over 30 years. But my Father wouldn't have been involved with it if it wasn't excellent. He passed away in 1992 and I still miss him very, very much. I enjoyed reading all your comments and plaudits. My name is Ross DeRosa. My Father was Anthony Salvatore DeRosa. One of my most cherished pictures on my wall, is a "Chef Of The Year" award, presented to him by "The Managers of Nickerson Farms" on November 4th 1976. I was not even 7 years old. It's signed by H.B. Hart President and Luther Henson? (it's a sloppy signature) Vice President. H.B was a WW2 Veteran that had the distinction of being "Battlefield Promoted" from something like a Sergeant, to a full Colonel! I spent many days at his house, and I believe his wife's name was Loretta? My Father spent many years with Henry's Drive Ins, working his way up from cook, to manager, to general manager, to district manager, eventually becoming President and CEO. He left the company after some unpleasantness that I know little about, but people wanted to make changes he did not agree with, so he resigned. They were out of business 6 months later. At one time I was given a T shirt that had T A E ironed on it, with a funny cartoon head of a man with bananas in his ears and it said GONE BANANAS! Possibly referring to their success. I enjoyed reading all your comments and plaudits. I'm stunned people are still talking about it over 40 years later. Sadly, my Father passed away in 1993, and I still miss him very, very much. God Bless. I just drove by one that is still standing, but abandoned, in Schulenberg, TX. My Mother worked as a Manager at the High Hill Mo location, which is still standing. She worked there for 15 years or so. I started pumping gas when I was 16. Full Service Skelly Gas! I graduated to dishwasher after a year, then prep cook, line cook, assistant manager. I was transferred to the Colby Kansas store as an assistant manager got caught in a terrible ice storm in Hayes on the way. I worked there for 2 years where the winters were harsh but the people were wonderful. From there I was promoted to Manager of the Harrisonville Mo.store. These were the waning days of Nickerson Farms which had been renamed OGY. Why I don't know pretty stupid name. I would never trade the memories and experiences and friends I made while I was on my Nickerson Farms journey. The stories I could tell LOL. It really was the first Cracker Barrell. I'm not sure what branch my family and I used to dine at but I was a kid and lived in Sikeston, Mo. We would dine there when my grandparents visited us from TN. and other special times. I remember eating there plenty of times but one memory has stayed with me. I remember when we parked it was next to the outside wall where the bee hive was located. There was a slot on the outside where the bees could come and go, best that I can remember. On this day there was cloth stuffed in the slot and bees where trying to get in but couldn't. I was going to pull the rag out and my dad told not to. I'm glad I didn't. When we got inside the dome was hanging at an odd angle and the hive was still inside the dome and a few bees. We were told that a large person had stumbled and hit it hard enough to knock it loose. I was so disappointed. We moved to TN and that was the last time I was there. It was a special treat when my family would go there to dine. I always wanted to return. I was checking to see if it was sill there when I found this site. Disappointed again. I was about 10 years old and I'm 51 now. I wasn't even aware there was more than one NF. I went to work at Nickerson Farms in 1968 as a dishwasher, I later became a drive attendant and worked in the Skelly gas station, I gradually went back to the kitchen and became a back up cook and occasionally the cook, I cooked many a loafs of bread and made honey butter, cooked many side of corn beef and boiled them in a big pot. It is a great memory to look back on. I worked there for 4 years. I forgot to say this Nickerson Farms was in Oklahoma at Mulhall Road off I-35, it is now a church. Worked at the NF Mt.Cory Ohio (I75&SR69) as a waiter.Worked with great people and have many good memories!